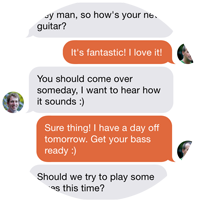 Jamseek - Easily find hobbyist musicians in London and jam away! Jamseek is your new jamming partner. Easily find hobbyist or beginner musicians around you to jam with, based on their instruments, favourite genres, and skills. 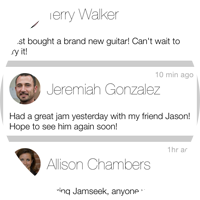 Whether you're a beginner or a hobbyist, Jamseek helps you find or organise the perfect jam session! We'll be launching a website version of the Jamseek app soon! It will enable everyone to access the great community, including all of you reading this who either don't own/use an iPhone, Android phone or tablet, or simply prefer to use websites instead of apps! Stay tuned on social media for a launch date! Create an account, log in and start searching! It has never been so easy to meet new people to jam and make friends... Want to know more about our features? Head here! Encourage your musical friends to join the app and help build the community! Make Jamseek your favourite social music app! Find hobbyist or learner musicians around you for any instruments and genres. 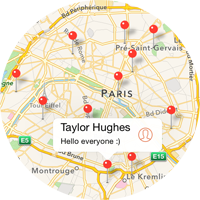 Browse the map and see where others are around you. You never know, your neighbours may play music too! Chat with anyone on Jamseek, meet and have the best jam session ever! A casual jam session can lead to great friendships, the outcome is up to you! Connect with people you enjoyed playing with, and stay informed about their activity at any time.